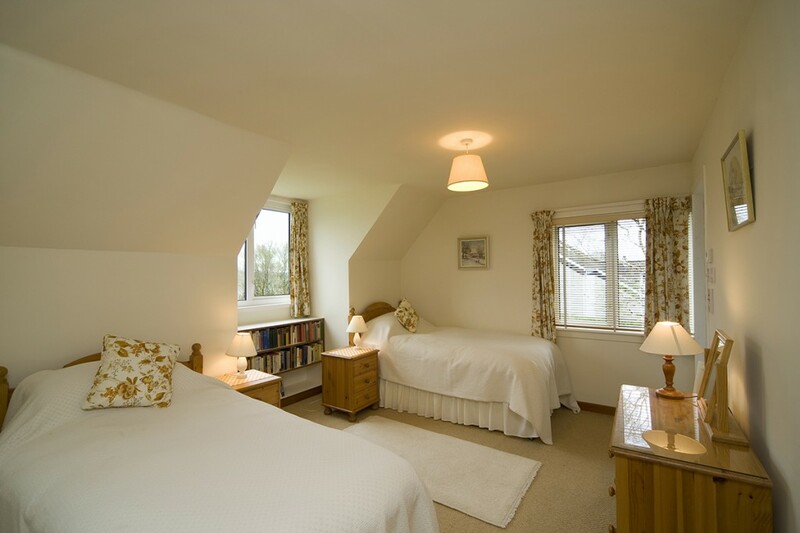 This is a spacious, light and comfortable room with panoramic east and south-facing windows. There are two sofas, two arm chairs and a fitted window seat. There is a 32″ HD TV and DVD player, and an open fire. There is an extensive collection of Scottish books, maps and guidebooks for the area. A splendid large room with a breakfast bar and table. 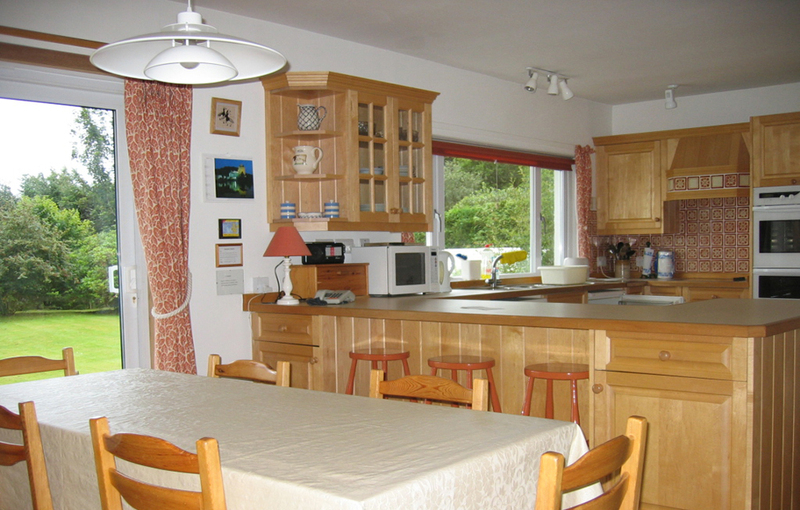 It is excellently equipped, with a double oven, ceramic hob, microwave, freezer, fridge and dishwasher. French windows lead from the dining room onto the sheltered terrace and garden. This is equipped with a washing machine, tumble drier, iron and ironing board. The ground floor bedroom has two single beds. It has a gentle, peaceful view over farmland and hills. It is next door to the cloakroom. This has a washbasin, toilet, heated towel rail, mirror and shelves and a ceramic-tiled floor. 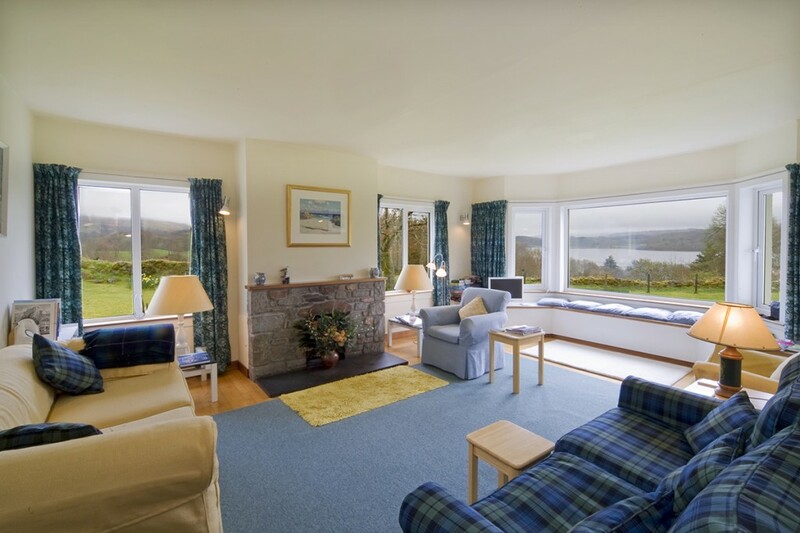 A spacious room with king-sized bed and magnificent views of loch and hills. This room has two single beds and a third pull-out bed. 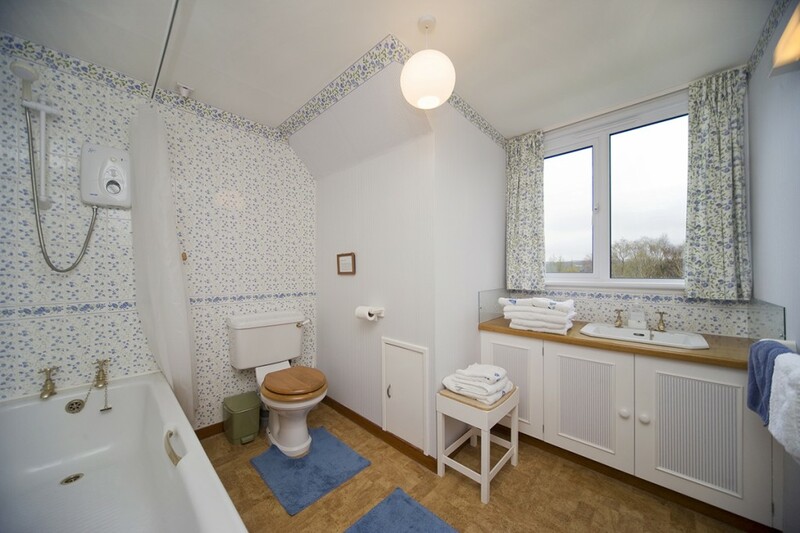 The bathroom has a bath, shower, toilet and washbasin, as well as a heated towel rail. 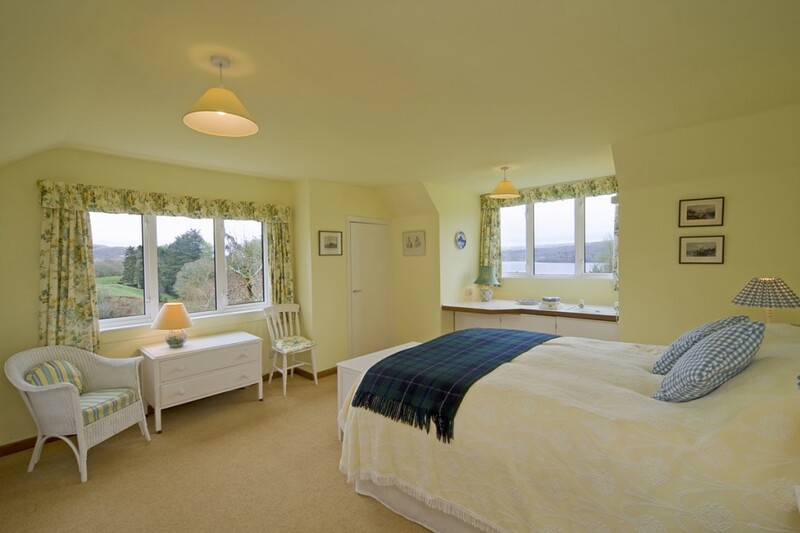 Also with a splendid view, the bathroom has a bath, shower, loo, washbasin and heated towel rail. The central heating is by night-store heating in the halls and kitchen, and invisible ceiling radiant heating in all the rooms. There are individual temperature controls in each room. Water heating is by electric immersion heater, and there is a good airing cupboard on the landing. EPC energy rating is G, but electricity use is included in rental. 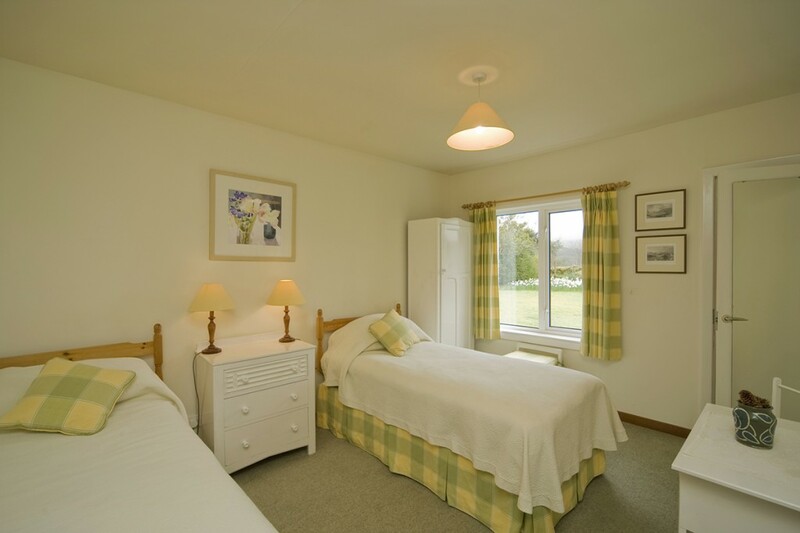 Goose down combination duvets and electric blankets are provided for the upstairs bedrooms and polyester duvets for the downstairs bedroom. A spare blanket is provided for each bed, and further blankets are available on request. A cot is also available on request – visitors should bring their own bedding and plastic mattress cover for this. ©Copyright 2018 Ardshellach North Connel.